¡Sea testigo de las riquezas del valle del Rin con un crucero turístico de un día desde Koblenz! Para comenzar su excursión por el río, consulte el horario y diríjase al punto de embarque cerca de Deutsche Eck en el paseo del Rin. (Haga clic en 'Ver información adicional' para ver el programa). ¿No está en Koblenz? ¡No es para preocuparse! 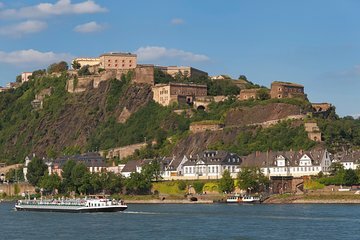 Su boleto le permite abordar un bote KD programado en cualquiera de las paradas de la ruta del río entre Koblenz y Cochem, así como las paradas entre Mainz y Koblenz, así como Linz y Colonia. ¡Diseña tu propio itinerario a tu ritmo! A lo largo del crucero, disfrute de cómodos asientos en un bote con clima controlado, tome un café o té de la cafetería a bordo (por su propia cuenta) y disfrute de las impresionantes vistas de los sitios clave a orillas del río. Destacan los hermosos castillos, los viñedos pintorescos, la roca de Loreley y los vibrantes paisajes de la ciudad. Suba y baje donde quiera que quiera explorar, ¡no se pierda el último barco de regreso a su punto de partida! el crucero por el Mosela ,no merece la pena hacer ida y vuelta,porque queda poco tiempo para ver el pueblo de Cochen ,que es precioso, y el viaje es lentísimo, debido a las exclusas que se tienen que pasar estuvimos 11horas en el barco ,llegó con 1 hora de retraso. So nice cruising the river and enjoying a lovely breakfast. 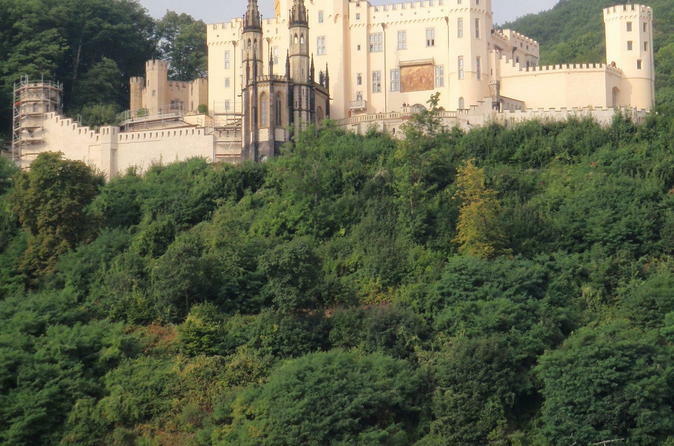 We went from Koblenz to St. Goar. Highly recommended! Great tour, breakfast is available on the boat. It was great! We were able to start at Bingen a very cute town, and went to St. Gore and explored. We then took the boat back to Bingen. At first were were unsure if we could start at any of the locations but it was no problem, you just have to go to the ticket counter to exchange your voucher for a ticket. We only did the one stop so not sure how it would work with multiple stops. The boat was large, rode smooth and comfortable. We would do it again but would start in Koblenz. Was a little disappointed. The trip all the way to Cochem was beautiful but long. When we got to Cochem we only had about 40 minutes before the boat headed back - we ended up taking the train back. In hind sight I wish we had got off at one of the smaller towns en route. Cochem is very touristy and crowded. My biggest complaint would be the smoking on the boat . It was horrible! Obviously if you are happy to ride down below you would be fine but who wants to be confined to the lower deck when they are traveling down the Rhine. It would have been nice if smoking had been restricted to the back of the boat. As it was the very front of the boat was occupied by three chain smokers so we had the pleasure of enjoying their smoke too as it blew back down the entire length of the boat. So much for enjoying the fresh air of the Rhine valley. Sad. Not so fun for young guys. We had a great day for this tour! It would have been a five star rating except there was little to no audio commentary. We passed many castles etc. but very few were named. Most of the time the audio was just to announce the stop.Although I don't like tours with constant talking there must be a happy medium! Nice stretch of the rhine and just what we were hoping for in views. All in all, very satisfied! The tour and boat was fine. It was a cold, rainy, blustery day, so we didn't get the experience we were hoping for, but that is not your company's fault. The stops were great and the on/off feature was what we wanted. Thanks!